Despite being one of the highest-profile charities in the UK with annual revenues over £480m, Cancer Research has felt the impact of the recession on fundraising and the need to innovate and drive efficiency through technology is more important than ever. Since joining the charity a year ago, IT director Mary Hensher has devised technology plans with mobility and data analytics to the fore, as well as ensuring the infrastructure is capable of coping with mounting demands and the IT team sufficiently skilled to respond. “When I joined I wasn’t starting from scratch. Cancer Research UK is a very driven organisation and you don’t have to have huge internal marketing strategies to enthuse people. So the IT strategy had to be aligned very closely with what everybody else was doing and support internal customers in bringing their ideas to life, properly and efficiently, and bringing in more revenue,” Hensher says. “It’s a strategy across 10 different themes. It starts with internal customer service – which is critical for an IT organisation, making sure that we have our relationship management system modernised – all the way to the mobility piece, social media, security and business intelligence. Hensher says a core part of her team’s work is ensuring the charity can take full advantage of mobile computing to bring in donations. “What we found out is the importance of mobile in how people donate to us. We were surprised with the interaction people have over those devices – not just in looking for information but also for donations,” she says. Making web interfaces more simple and mobile-friendly was an important consideration during a rebranding exercise the charity underwent last year. Creating mobile-friendly microsites for campaigns such as the Stand Up For Cancer telethon and Race for Life has also become standard practice. But mobility is also seen as a vehicle to improve internal processes and increase productivity. “We are looking at what we do for our own people regarding mobility. For example, we are analysing how effective a bring-your-own-device (BYOD) approach would be, so we can support people securely – and having our virtual desktop infrastructure (VDI) set-up really helps, as data doesn’t need to be carried around and can be tapped in from any device,” Hensher says. As well as information on its 40,000 regular supporters, Cancer Research UK has built up a database of millions of records. This is managed by its core system, a Siebel customer relationship management (CRM) platform coupled with Oracle’s business intelligence reporting tools. Hensher says enhancing the CRM can be quite complex, given the number of supporters and data being handled by the system. Making sure the infrastructure is as efficient as it should be - and also re-usable - is one of her goals. “We are commoditising some of our IT so we don’t need to be continuously re-inventing the underlying infrastructure when colleagues come up with ideas for fundraising campaigns. With SharePoint, Drupal and our existing Oracle platform, we can re-use components to be more agile in bringing ideas to market,” she says. “On what you would call ‘normal infrastructure’ – such as HP, Cisco networks and EMC storage – it’s all about getting more efficiency and capacity, matching our capacity for data and getting more of that archived onto cheaper storage. Data analytics is also an area where Hensher wants to make improvements. The goal here is to use existing supporter data to run more effective fundraising efforts and also to provide relevant and reliable information about cancer to the general public. “We do a lot of analysis with our Oracle tools and use a lot of Google Analytics functionality for our externally-facing channels. We analyse how people interact with us, how and when do they donate. That way, we can match our technology with how people interact with us,” she says. Hensher’s predecessor, Paul Feldman, implemented a major virtualisation and consolidation programme, which accompanied Cancer Research’s move from multiple sites to central headquarters in London. She says that initiative enabled the organisation to move on to further technology-enabled improvements. 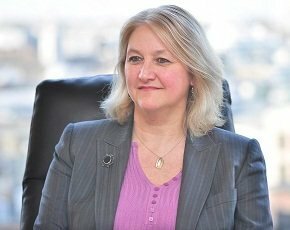 “When I came in, I thought the amount of virtualisation that had gone in the process of moving from eight buildings to one and to co-located datacentres was high, compared to other organisations,” says Hensher. “Most places have had a high degree of virtualisation across the back-end and servers by now, but here, we are talking about desktops at user level, which is not as prolific, as there are complications involved despite the enormous benefit to be had,” she says. The way to handle the change was to first make tweaks in network performance to ensure the virtual desktop infrastructure (VDI) would handle user volumes, as well as getting people used to the idea they were not going to have a desktop anymore, but a unit on their desks – and that no data would be managed by them. “The VDI concept was great for IT, as it improved data management and security, but from the user perspective it takes a while to get used to that technology. Also, VDI does not handle things like Flash and video streaming very well, though in the last year it has got a lot better, we have been able to beef it up to get it to handle that much better than it did,” says Hensher. Hensher is also looking to boost the skills base in her 160-strong IT department, in an exercise she describes as “hiring and retiring”, which involves both recruitment and re-training. “The shape of the organisation and the skills IT people need are changing, so we are hiring in areas we didn’t focus much on before, such as SharePoint. And there are also some things we no longer require,” she says. However, Hensher wants the right balance when it comes to outsourcing. For example, Cancer Research UK already does a lot of testing for external products such as its website, which is a critical part of how the charity raises money. But at the same time, she does not see the need to hire a lot of permanent resource for testing alone. “Although we have a small core of internal testing, we are in a request for proposals (RFP) process to get into an ongoing relationship with a testing partner that we can tap on and off as we need functional, penetration testing and so on, so we don’t need to have all of that in-house,” she says. Hensher says she is looking to change her IT organisation in subtle and major ways to match the future. That means nurturing and hiring professionals with good skills in project management, business analysis, project governance and sponsorship, as well as training existing staff. “Those skills have been recognised but are not as mature as they should be in the IT organisation,” she says. Getting people excited about working for one of the most recognisable charities in the world is not Hensher’s main challenge, but delivering technology to increase the amount of money her employer raises for cancer research is. “We are more fortunate than other charities in that world, as the work we do is well-known and respected. But we are in a difficult economic climate and people have less money to give to charity. So we have to constantly find ways to capture people’s imagination in making sure we get those donations,” she says.